Here to help: IT teacher Chris Ewin, centre, has been recognised for his commitment to showing seniors how to master new technology. 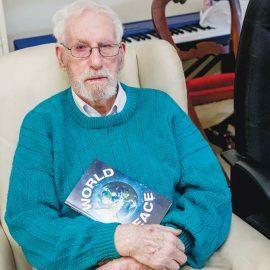 HELPING older residents take charge of their lives through their computer is a long-term passion for Longbeach PLACE teacher Chris Ewin. 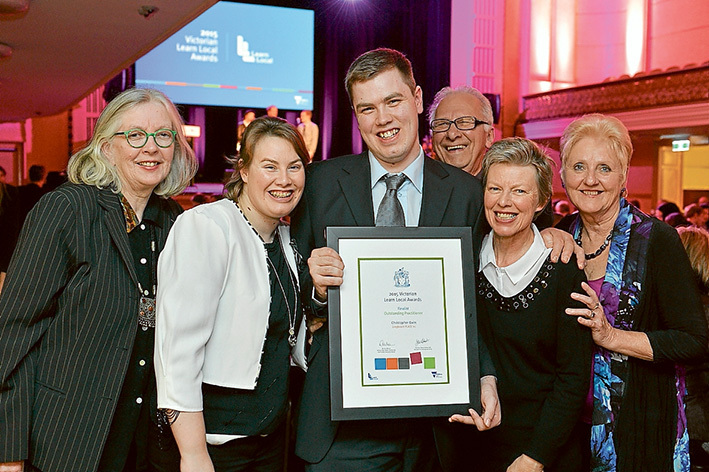 His skills and abilities in the area have been commended by him being named runner-up in the Victorian Government Learn Local Awards Outstanding Practitioner section last month. He was one of 16 nominated. Mr Ewin has been an IT teacher at the Chelsea centre for the past 12 years after starting as a 15-year-old. Now, as co-facilitator of the Chelsea Users’ Support Group, he holds seniors’ digital literacy classes helping oldies master the mysteries of emails, iPads, on-line banking and even Facebook. It’s useful stuff. One of Mr Ewin’s most practical aids is an online banking simulator in which oldies learn how to transfer money and monitor their transactions on their PCs without risking their accounts. “The students grow confident in moving money around via the simulator before actually going onto the bank’s website – so everything is safe,” Longbeach PLACE manager Lorna Stevenson said. “These days people are always being encouraged to use their computers for personal business but there are big gaps in our knowledge. Also, there are a lot of barriers to some people either getting a PC or being able to use one proficiently. The Longbeach classes teach older students to manage their affairs themselves for an affordable price – without losing control or putting themselves at risk. The PC support group meets monthly, with Q&A sessions and sample tutorials demonstrating features, such as Skype. Mr Ewin was nominated for the City of Kingston Young Citizen of the Year in 2011 and his sister Carrie for the Junior Citizen of the Year in January this year. “It’s really good for our organisation to be able to put forward someone from the younger generation who has volunteered in our sector,” Ms Stevenson said. Adult, Community and Further Education Board chair Rowena Allen said Learn Local organisations supported those facing barriers to education, such as having a disability, poor literacy or numeracy, or newly arrived migrants. They were then better able to engage in education and improve their lives. “These awards showcase this work, and will inspire other learners and educators by demonstrating what can be achieved by studying at your nearest Learn Local,” she said.